I always get a bit nostalgic for the summers of my childhood around this time of year. The advertisements for back-to-school shopping are starting and I can walk into any bookstore to find some of my favorite food magazines already touting the best stews for fall. When I was growing up, summer seemed to last forever. Those were the days before we scheduled every spare minute of a child’s life with sports and activities and year-round school had yet to catch on. If you weren’t enrolled in summer school, which I rarely was, you had a solid three months, from June through the end of August or even Labor Day, to enjoy the summer, and enjoy it we did. As with most things in life, my memories of summer center on food. The American flag cake my mother made using blueberries and raspberries for the Fourth of July one year, eating almost every family dinner out on our back patio with citronella candles burning to ward off the bees and oddly enough, because I don’t think we used them that much, the Tupperware popsicle molds that we experimented with one year. The only clear memory I have of trying out the molds is the ultra-gourmet diet coke popsicle I created. While I did like to play with food when I was young, my experiments, much like this one, rarely produced something you would actually want to eat. I’ve seen many recipes for truly gourmet popsicles that far outpace my diet coke concoction. From puréed fruit mixed with prosecco to coconut milk with lime juice and most recently, a semifreddo recipe frozen in popsicle molds for individual servings. That is the recipe that pushed me over the edge and sent me out on a search for my own set of molds. It was surprisingly hard to find the old-fashioned popsicle sticks. Since most molds come with their own plastic stick, grocery stores, at least the ones by me, don’t seem to carry them anymore. I ended up in an Office Depot in the craft section to hunt them down. Tools in hand, I rushed home to try my hand at a semifreddo (first one I’d ever made) and making my own popsicles (first foray into the non-diet coke flavored arena). These came out delicious and rich and sweet, but not overly so. When I make them again, I won’t use my dark-yolk eggs. 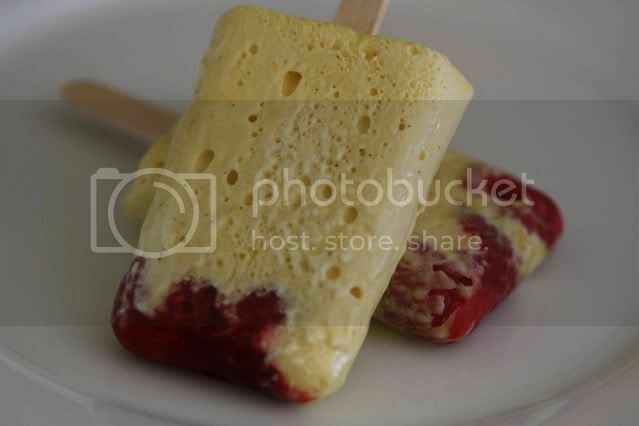 That deep yolk color made the popsicles more yellow than the beautiful off-white I was going for. Other than that, these are perfect as is. The original recipe called for frozen raspberries, but I went with fresh. Use whatever you have on hand. Place the eggs, egg yolk, vanilla and sugar in a heatproof bowl and place over a bowl of simmering water (you can use a double boiler, but a bowl works better with the electric mixer). Use a handheld mixer to beat the mixture for 6 - 8 minutes until thick. Set aside. Beat the cream to stiff peaks using a stand mixer or clean off the handheld mixer and use it. Gently fold into the egg mixture. Divide the raspberries between 12 popsicle molds. 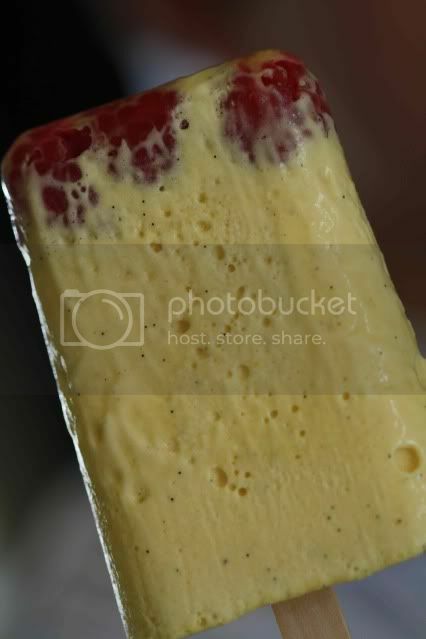 Pour enough semifreddo to come about one inch up the popsicle mold. Tap the molds against the counter to get the semifreddo to settle into the base of the mold, around the raspberries, then finish filling the molds with semifreddo. Cover the molds with aluminum foil and insert popsicle sticks through the foil - this will help the sticks stay upright while freezing. Freeze until solid, about six hours. Quick! Enter this in the ice cream social as it ends today! Great idea! Those look perfect for our hot, humid nights in Corpus. Quick easy yet so delicious!! Those look delicious! I was just looking at ice lolly moulds in Lakeland yesterday too. I must have been psychic! Wish I had listened to my intuition and bought them! This is great, such an inventive way to eat a semi freddo. These are really gorgeous! They look so refreshing and perfect for a hot day! Genius. Amazing. I want one! Now. Where did you end up finding the popsicle molds? When we were kids, my mom used to make us frozen orange juice popsicles. We loved them, but today, I think I'd prefer your fancy schmancy version! Perfect! Easy and delicious...you can't beat that! Plus, they are so pretty. Like you, most of my memories are tied to food as well... it's just so easy to evoke one's past when you recal a taste, a smell, a texture... food is wonderful for that! I know what you mean about summertime memories being centered around food... We never made popsicles at home, but I have tons of other food-related summer memories. This makes me want to run out and buy some popsicle molds! They look delicious. Rebecca - the molds were the easy part, I found them at Bed Bath and Beyond. As for the popsicle sticks, that may take you a little more time. I finally ended up at Office Depot in the craft section! these look amazing! I've wanted to try to make semifreddo and the raspberry is a perfect addition. These look absolutely delicious...and I love the goat cheese and tomato tart.